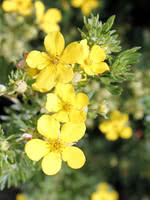 Tundra Rose is known as Shrubby Cinquefoil (Potentilla) in our system. Both names refer to Dasiphora fruticosa syn. Potentilla fruticosa, the exact same species.